I was interviewed at the Stanford Business School and in listening to the podcast, I realize I repeated some of my usual soundbites but embedded in the conversation were a few things I’ve never shared before about service. Hacking for Defense is a new course at Stanford’s Engineering School in the Spring of 2016. It is being taught by Tom Byers, Steve Blank, Joe Felter and Pete Newell and is advised by former Secretary of Defense Bill Perry. Join a select cross-disciplinary class that will put you hands-on with the masters of lean innovation to help bring rapid-fire innovative solutions to address threats to our national security. Why? What do all these groups in the Department of Defense and Intelligence Community (DOD/IC) have in common? Up until the dawn of the 21st century, they defined military technology superiority. Our defense and intelligence community owned and/or could buy and deploy the most advanced technology in the world. Their R&D groups and contractors had the smartest domain experts who could design and manufacture the best systems. Not only were they insulated from technological disruption, they were often also the disrupters. (During the Cold War we used asymmetric technologies in silicon and software to disrupt the Soviet Union’s lead in conventional weapons.) Yet in the last decade the U.S. Department of Defense and Intelligence Community are now facing their own disruption from ISIS. al-Qaeda. North Korea. Crimea. Ukraine. DF-21 and Islands in the South China Sea. Today these potential adversaries are able to harness the power of social networks, encryption, GPS, low-cost drones, 3D printers, simpler design and manufacturing processes, agile and lean methodologies, ubiquitous Internet and smartphones. Our once closely held expertise in people, processes and systems that we once had has evolved to become commercial off-the-shelf technologies. U.S. agencies that historically owned technology superiority and fielded cutting-edge technologies now find that off-the-shelf solutions may be more advanced than the solutions they are working on, or that adversaries can rapidly create asymmetric responses using these readily available technologies. Perhaps more important than the technologies, these new adversaries can acquire and deploy disruptive technology at a speed that to us looks like a blur. They can do so because most have little legacy organizational baggage, no government overhead, some of the best software talent in the world, cheap manpower costs, no career risk when attempting new unproven feats and ultimately no fear of failure. Terrorists today live on the ‘net and they are all early adopters. They don’t need an office in Silicon Valley to figure out what’s out there. They are experts in leveraging Web 2.0 and 3.0. They are able to collaborate using Telegram, Instagram, Facebook, Skype, FaceTime, YouTube, wiki’s, IM/chat. Targeting, assessments, technology, recipes, and tactics all flow at the speed of a Lean Startup. They can crowd-source designs, find components through eBay, fund through PayPal, train using virtual worlds and refine tactics, techniques and procedures using massive on-line gaming. All while we’re still writing a Request for a Proposal from within the US Government procurement and acquisition channels. In contrast to the agility of many of our adversaries, the Department of Defense and the Intelligence Community have huge investments in existing systems (aircraft carriers, manned fighters and bombers, large satellites, etc. ), an incentive system (promotions) that supports the status quo, an existing contractor base with major political influence over procurement and acquisition, and the talent to deliver complex systems that are the answer to past problems. Our drive for ultimate efficiency in buying military systems (procurement) has made us our own worst enemy. These acquisition and procurement “silos” of excellence are virtually impenetrable by new ideas and requirements. Even in the rare moments of crisis and need, when they do show some flexibility, their reaction is often so slow and cumbersome that by the time the solutions reach the field, the problem they intended to solve has changed so dramatically the solutions are useless. The incentives for acquiring and deploying innovation in the DOD/IC with speed and urgency are not currently aligned with the government acquisition, budgeting, and requirements processes, all of which have remained unchanged for decades or even centuries. Today, many in the Department of Defense and Intelligence Community are searching for a magic technology bullet – the next Offset Strategy – convinced that if they could only get close to Silicon Valley, they will find the right technology advantage. It turns out that’s a massive mistake. What Silicon Valley delivers is not just new technology but – perhaps even more importantly – an innovation culture and mindset. We will not lose because we had the wrong technology. We will lose because we couldn’t adopt, adapt and deploy technology at speed and in sufficient quantities to overcome our enemies. Ultimately the solution isn’t reforming the acquisition process (incumbents will delay/kill it) or buying a new technology and embedding it in a decade-long procurement process (determined adversaries will find asymmetric responses). The solution requires new ways to think about, organize, and build and deploy national security people, organizations and solutions. Stanford’s new Hacking for Defense class is a part of the solution. In Hacking for Defense a new class at Stanford’s School Engineering this spring, students will learn about the nation’s emerging threats and security challenges while working with innovators inside the Department of Defense (DoD) and Intelligence Community. The class teaches students entrepreneurship while they engage in what amounts to national public service. Hacking for Defense uses the same Lean LaunchPad Methodology adopted by the National Science Foundation and the National Institutes of Health and proven successful in Lean LaunchPad and I-Corps classes with 1,000’s of teams worldwide. Students apply as a 4-person team and select from an existing set of problems provided by the DoD/IC community or introduce their own ideas for DoD/IC problems that need to be solved. Student teams will take actual national security problems and learn how to apply Lean Startup principles to discover and validate customer needs and to continually build iterative prototypes to test whether they understood the problem and solution. Most discussion about innovation of defense systems acquisition using an agile process starts with writing a requirements document. Instead, in this class the student teams and their DOD/IC sponsors will work together to discover the real problems in the field and only then articulate the requirements to solve them and deploy the solutions. Each week, teams will use the Mission Model Canvas (a DOD/IC variant of the Business Model Canvas) to develop a set of initial hypotheses about a solution to the problem and will get out of the building and talk to all Requirement Writers, Buyers (Acquisition project managers) and Users (the tactical folks). As they learn, they’ll iterate and pivot on these hypotheses through customer discovery and build minimal viable prototypes (MVPs). Each team will be guided by two mentors, one from the agency that proposed the problem and a second from the local community. In addition to these mentors, each H4D student team will be supported by a an active duty military liaison officer drawn from Stanford’s Senior Service College Fellows to facilitate effective communication and interaction with the problem sponsors. Today if college students want to give back to their country they think of Teach for America, the Peace Corps, or Americorps. Few consider opportunities to make the world safer with the Department of Defense, Intelligence Community and other government agencies. The Hacking for Defense class will promote engagement between students and the military and provide a hands-on opportunity to solve real national security problems. Our goal is to open-source this class to other universities and create the 21st Century version of Tech ROTC. By creating a national network of colleges and universities, the Hacking for Defense program can scale to provide hundreds of solutions to critical national security problems every year. We’re going to create a network of entrepreneurial students who understand the security threats facing the country and getting them engaged in partnership with islands of innovation in the DOD/IC. This is a first step to a more agile, responsive and resilient, approach to national security in the 21st century. In peacetime the U.S. military is an immovable and inflexible bureaucracy. In wartime it can adapt and adopt organizational change with startling speed. BMNT, a new Silicon Valley company, is combining the Lean Methods it learned in combat with the technology expertise and speed of startups. In World War II the U.S. government reengineered its approach to building weapons. In a major break from the past, where the military designed all its own weapons, 10,000 scientists and engineers from academia worked in civilian-run weapons labs (most headquartered in universities) in an organization called the Office of Scientific Research and Development (OSRD). 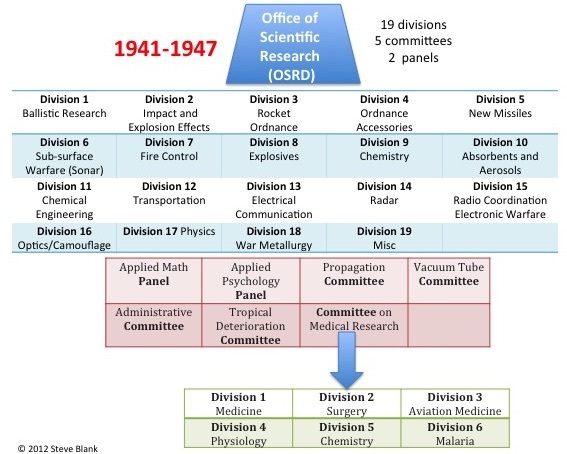 The OSRD developed advanced electronics: radar, electronic warfare, rockets, sonar, proximity fuse, Napalm, the Bazooka and new drugs such as penicillin and cures for malaria. One OSRD project – the Manhattan Project – the development of the atomic bomb – was so secret and important that it was spun off as a separate program. The University of California managed research and development of the bomb design at Los Alamos while the US Army managed the Los Alamos facilities and the overall administration of the project. After the war the U.S. split up the functions of the OSRD. Nuclear weapons went to the new Atomic Energy Commission (AEC), basic weapons systems research went to the Department of Defense (DOD) and all U.S. biomedical and health research went back to the National Institutes of Health (NIH). In 1950, government support of basic science research in U.S. universities became the charter of the National Science Foundation (NSF). Each of these independent research organizations would support a mix of basic and applied research. During the Cold War the U.S. and the Soviet Union faced off with a nuclear deterrence policy called mutually assured destruction (aptly named MAD.) But to fight a conventional war in Europe, Soviet forces had built a 3 to 1 advantage in tanks, artillery, armored personnel carriers, and soldiers. In response the U.S. developed a new strategy in the late 1970’s to counter the Warsaw Pact. Instead of matching the U.S.S.R. tank for tank or solider to solider, the U.S. saw that it could change the game and take advantage of a lead we had that was getting longer every day – using our computer and chip technology to aggressively build a new generation of weapons that the Soviet Union could not. At the heart of this “offset strategy” was “precision strike,” – building stealth aircraft to deliver precision guided munitions unseen by enemy radar, and designing intelligence and reconnaissance systems that would target for them. The offset strategy was smart weapons, smart sensors, and stealth using silicon chips, electronics and computers that only the U.S. could design and produce. By the mid-1980’s the Soviet military was struggling to keep up with this “revolution in military affairs. The announcement of the Strategic Defense Initiative (Star Wars) further destabilized the Soviet Union. When I first started teaching customer development (searching, validating and executing a business model), one of my students pointed out that customer development was similar to the theory of a military strategist, John Boyd. In the 1960’s, Boyd, who was a fighter pilot, proposed that instead of executing a fixed plan, wars would be won by those who can Observe, Orient, Decide and Act (the OODA Loop.) After being ignored for decades, Boyd’s OODA Loop drove the U.S. war fighting strategy in both Gulf Wars. The OODA Loop was the Lean Startup philosophy before lean. In Afghanistan in 2002 U.S. soldiers were tasked to clear caves that the Taliban used to store equipment. Many of the caves still had Taliban fighters inside while others had been booby-trapped. To clear the caves soldiers threw grappling hooks inside then pulled the hooks out to catch trip-wires and explode bombs. But often this technique did not work and soldiers died. The Army realized they needed to do something more effective. They gave the problem to Colonel Bruce Jette, and 90 days and $750,000 later he had bypassed the existing Army acquisition system and bought existing robots from companies. Exponent provided the PackBot and the Marcbot and deployed them to the field. From that day the Army’s Rapid Equipping Force (REF) was born. The REF’s goal is to deliver technology solutions to front-line soldiers in days and weeks, instead of months and years either by using solutions from previous REF efforts or existing government- or commercial-off-the-shelf technologies purchased with a government credit card. The REF had permission to shortcut the detailed 100+ page requirements documents used by the defense acquisition process. It developed a ten-line short form that listed the most important parts of the requirement. The REF also had its own budget, which it could use to acquire equipment. Soon the REF was sending teams of civilian and military subject matter experts out into the field to discover what they needed. REF expanded its operations to include forward teams in Kuwait and Iraq to provide technology to fill capability gaps and to counter the highest priority threats. By the end of 2007, the REF had delivered more than 550 types of equipment and more than 75,000 individual items. The average time from receiving a request from the field to delivering a solution to the soldiers was 111 days. In 2010 Colonel Peter Newell took over the REF and turned its focus into what we would call a Lean Startup. 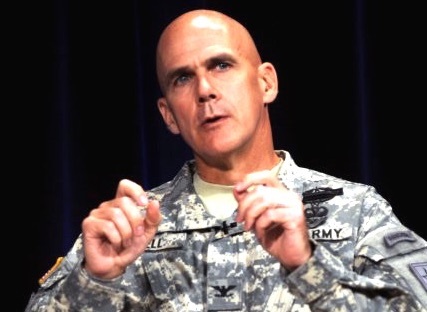 He came up with his version of the OODA loop to explain to people how REF should behave. To get closer to his customers, Newell commissioned three mobile laboratories that were airlifted to forward operating bases. These labs included a Computer Numerical Control milling machine and 3-D printers for rapid prototyping. When Colonel Peter Newell left the Army, he came to Silicon Valley at the urging of a friend and fellow retired Army Colonel, Joe Felter, a Stanford PhD who moved to Palo Alto and Stanford after a career in the Special Forces. Newell accepted Felter’s invitation to join a company he had originally established. BMNT does for the Department of Energy, the Department of Defense and the Intelligence Community what the REF did for the U.S. Army – build teams that deliver solutions to complex problems, with access to the entire network of suppliers and partners that Newell and Felter developed throughout their careers. BMNT‘s first hackathon, “Hacking the Supply Chain,” brought together diverse teams of technologists and users to provide solutions to the questions: How do you supply troops which can be sent on short-notice, for long periods to places where there are no existing bases or supplies? How might we create the most resilient and efficient supply chain possible for our forward-deployed land forces in 2025? In mid-April, the ideas generated at BMNT‘s first hackathon will be presented to a panel of experienced senior entrepreneurs, engineers, and military and government officials and then sent to the Department of Defense with specific recommendations on the technologies with potential to support them. In reality, what BMNT is trying to fix is the way the Department of Defense acquires radically new technology and ideas. While DARPA tries to fill that need, today the primary conduits for bringing new technology to the government are the prime contractors (e.g., Lockheed, Boeing, Raytheon, Northrup Grumman, L3, General Dynamics, et al.) But most of these contractors focus on fulfilling existing technology needs that can be profitable. Today, incentives for bringing innovation into the government with speed and urgency are not aligned with the government acquisition, budgeting, and requirements process. As a result, the DoD fails to acquire truly innovative technologies (much less paradigm-changing technologies) in a timely fashion. The irony is that while the U.S. government has had a robust national science and technology policy, it lacks a national industrial policy; leaving that to private capital. This approach was successful when U.S. industry was aligned with manufacturing in the U.S., but became much less so in the last decade when the bottom-line drove industries offshore. In lieu of the U.S. government’s role in setting investment policy, venture capital has set the direction for what new industries attract capital. This series of blog posts is my attempt to understand how science and technology policy in the U.S. began, where the money goes and how it has affected innovation and entrepreneurship. In future posts I’ll offer some observations how we might rethink U.S. Science and National Industrial Policy as we face the realities of China and global competition. In 1940 Bush proposed this idea to President Roosevelt who agreed and appointed Bush as head, which was first called the National Defense Research Committee and then in 1941 the Office of Scientific Research and Development (OSRD). 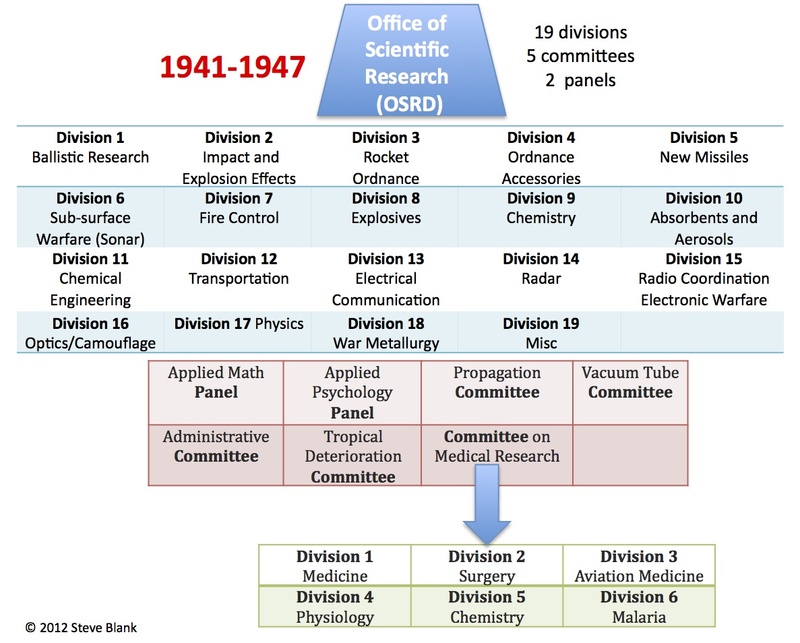 OSRD divided the wartime work into 19 “divisions”, 5 “committees,” and 2 “panels,” each solving a unique part of the military war effort. These efforts spanned an enormous range of tasks – the development of advanced electronics; radar, rockets, sonar, new weapons like proximity fuse, Napalm, the Bazooka and new drugs such as penicillin and cures for malaria. The civilian scientists who headed the lab’s divisions, committees and panels were given wide autonomy to determine how to accomplish their tasks and organize their labs. Nearly 10,000 scientists and engineers received draft deferments to work in these labs. One OSRD project – the Manhattan Project which led to the development of the atomic bomb – was so secret and important that it was spun off as a separate program. The University of California managed research and development of the bomb design lab at Los Alamos while the US Army managed the Los Alamos facilities and the overall administration of the project. The material to make the bombs – Plutonium and Uranium 235 – were made by civilian contractors at Hanford Washington and Oak Ridge Tennessee. OSRD was essentially a wartime U.S. Department of Research and Development. Its director, Vannever Bush became in all but name the first presidential science advisor. Think of the OSRD as a combination of all of today’s U.S. national research organizations – the National Science Foundation (NSF), National Institute of Health (NIH), Centers for Disease Control (CDC), Department of Energy (DOE) and a good part of the Department of Defense (DOD) research organizations – all rolled into one uber wartime research organization. OSRD’s impact on the war effort and the policy for technology was evident by the advanced weapons its labs developed, but its unintended consequence was the impact on American research universities and the U.S. economy that’s still being felt today. Universities were started with a mission to preserve and disseminate knowledge. By the late 19th century, U.S. universities added scientific and engineering research to their mission. However, prior to World War II corporations not universities did most of the research and development in the United States. Private companies spent 68% of U.S. R&D dollars while the U.S. Government spent 20% and universities and colleges accounted just for 9%, with most of this coming via endowments or foundations. Give the U.S. the undisputed lead in a technology and innovation driven economy – until the rise of China. As the war drew to a close, university scientists wanted the money to continue to flow but also wanted to end the government’s control over the content of research. That was the aim of Vannevar Bush’s 1945 report, Science: the Endless Frontier. Bush’s wartime experience convinced him that the U.S. should have a policy for science. His proposal was to create a single federal agency – the National Research Foundation – responsible for funding basic research in all areas, from medicine to weapons systems. He proposed that civilian scientists would run this agency in an equal partnership with government. The agency would have no laboratories of its own, but would instead contract research to university scientists who would be responsible for all basic and applied science research. But it was not to be. After five years of post-war political infighting (1945-1950), the U.S. split up the functions of the OSRD. The military hated that civilians were in charge of weapons development. In 1946 responsibility for nuclear weapons went to the new Atomic Energy Commission (AEC). In 1947, responsibility for basic weapons systems research went to the Department of Defense (DOD). Medical researchers who had already had a pre-war National Institutes of Health chafed under the OSRD that lumped their medical research with radar and electronics, and lobbied to be once again associated with the NIH. In 1947 the responsibility for all U.S. biomedical and health research went back to the National Institutes of Health (NIH). Each of these independent research organizations would support a mix of basic and applied research as well as product development. Despite the failure of Bush’s vision of a unified national research organization, government funds for university research would accelerate during the Cold War. Coming in Part 2 – Cold War science and Cold War universities. More in the next post, Part 6b of the Secret History of Silicon Valley. How to build regional entrepreneurial communities has just gotten it’s first “here’s how to do it” book. Brad Feld’s new book Startup Communities joins the two other “must reads,” (Regional Advantage and Startup Nation) and one “must view” (The Secret History of Silicon Valley) for anyone trying to understand the components of a regional cluster. 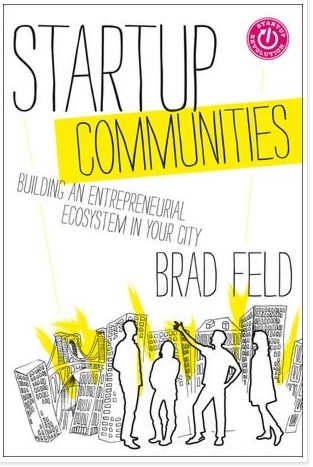 Feld’s thesis is that unlike the common wisdom, it is entrepreneurs that lead a startup community while everyone else feeds the community. Feld describes the characteristics of those who want to be regional Entrepreneurial Leaders; they need to be committed to their region for the long term (20+ years), the community and its leaders must be inclusive, play a non-zero sum game, be mentorship-driven and be comfortable experimenting and failing fast. Feeders include the government, universities, investors, mentors, service providers and large companies. He points out that some of these, government, universities and investors think of themselves as the leaders and Feld’s thesis is that we’ve gotten it wrong for decades. This is a huge insight, a big idea and a fresh way to view and build a regional ecosystem in the 21st century. It may even be right. One of the most surprising (to me) was the observation that a regional community must have continual activities and events to engage all participants. Using Boulder Colorado as an example, (Feld’s home town) this small entrepreneurial community runs office hours, Boulder Denver Tech Meetup, Boulder Open Coffee Club, Ignite Boulder, Boulder Beta, Boulder Startup Digest, Startup Weekend events, CU New Venture Challenge, Boulder Startup Week, Young Entrepreneurs Organization and the Entrepreneurs Foundation of Colorado. For a city of 100,000 (in a metro area of just 300,000 people) the list of activities/events in Boulder takes your breath away. They are not run by the government or any single organization. These are all grassroots efforts by entrepreneurial leaders. These events are a good proxy for the health and depth of a startup community. One of the best definitions in the book is when Feld articulates the difference between an incubator and an accelerator. An incubator provides year-round physical space, infrastructure and advice in exchange for a fee (often in equity.) They are typically non-profit, attached to a university (or in some locations a local government.) For some incubators, entrepreneurs can stay as long as they want. There is no guaranteed funding. In contrast, an accelerator has cohorts going through a program of a set length, with funding typically provided at the end. Feld describes TechStars (founded in 2006 with David Cohen) as an example of how to build a regional accelerator. In contrast to other accelerators TechStars is mentor-driven, with a profound belief that entrepreneurs learn best from other entrepreneurs. It’s a 90-day program with a clear beginning and end for each cohort. TechStars selection criteria is to first focus on picking the right team then the market. They invest $118,000 ($18k seed funding + $100K convertible note) in 10 teams per region. 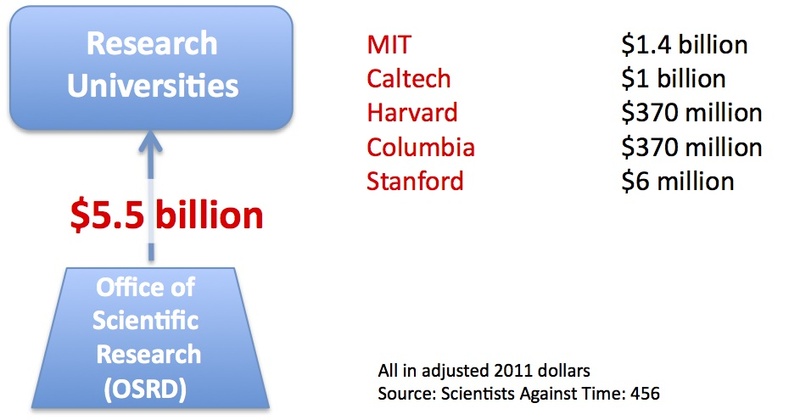 To the entrepreneurial community Stanford and MIT are held up as models for “outward-facing” research universities. They act as community catalysts, as a magnet for great entrepreneurial talent for the region, and as teachers and then a pipeline for talent back into the region. In addition their research offers a continual stream of new technologies to be commercialized. Feld’s observation is that that these schools are exceptions that are hard to duplicate. In most universities entrepreneurial engagement is not rewarded, there’s a lack of resources for entrepreneurial programs and cross-campus collaboration is not in the DNA of most universities. Rather than thinking of the local university as the leader, Feld posits a more effective approach is to use the local college or university as a resource and a feeder of entrepreneurial students to the local entrepreneurial community. He uses Colorado University’ Boulder as an example of of a regional university being as inclusive as possible with courses, programs and activities. Finally, he suggests engaging alumni for something other than fundraising – bringing back to the campus, having them mentor top students and celebrating their successes. Feld is not a big fan of top-down government driven clusters. He contrasts the disconnect between entrepreneurs and government. Entrepreneurs are painfully self-aware but governments are chronically not self-aware. This makes government leaders out of touch on how the dynamics of startups really work. Governments have a top-down command and control hierarchy, while entrepreneurs work in a bottoms-up networked world. Governments tend to focus on macro metrics of economic development policy while entrepreneurs talk about lean, startups, people and product. Entrepreneurs talk about immediate action while government conversations about policy do not have urgency. Startups aim for immediate impact, while governments want to control. 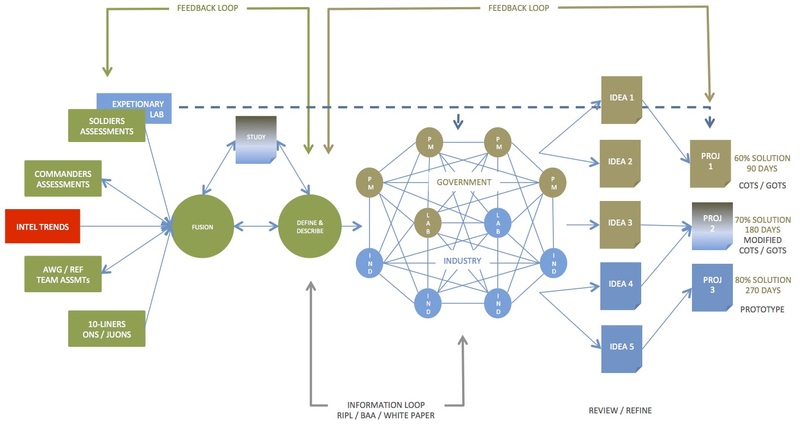 Startup communities are networked and don’t lend themselves to a command and control system. I was surprised to note that the biggest cultural meme of Silicon Valley didn’t make his Community Culture chapter – failure equals experience. Feld closes by highlighting some of the issues faced by a startup community in Boulder. The one he calls Parallel Universes notes that there may be industry specific (biotech, clean tech etc.) startup communities sitting side-by-side and not interacting with each other. There’s data that that seems to indicate a few of Feld’s claims about about the limited role of venture, universities and governments might be overly broad (but doesn’t diminish his observation that they’re feeders not leaders.) In addition, while Silicon Valley was a series of happy accidents, other national clusters have extracted its lessons and successfully engineered on top of those heuristics. And while I might have misread Feld’s premise about local venture capital, but it seems to be, “if there isn’t a robust venture capital in your region it’s because there isn’t a vibrant entrepreneurial community with great startups. As venture capital exists to service startup when great startups are built investors will show up.” Wow. Finally, local government top-down initiatives are not the only way governments can incentivize entrepreneurial efforts. Some like the National Science Foundation Innovation Corps have had a big bang for little bucks. Entrepreneurship is rising in almost every major city and region around the world. I host at least one region a week at the ranch and each of these regions are looking for a roadmap. Startup Communities is it. It’s a strategic, groundbreaking book and a major addition to what was missing in the discussion of how to build a regional cluster. I’m going to be quoting from it liberally, stealing from it often, and handing it out to my visitors. Foreign visitors to Silicon Valley continually mention how willing we are to help, network and connect strangers. We take it so for granted we never even to bother to talk about it. It’s the “Pay-It-Forward” culture. in 1962 Walker’s Wagon Wheel Bar/Restaurant in Mountain View became the lunch hangout for employees at Fairchild Semiconductor. When the first spinouts began to leave Fairchild, they discovered that fabricating semiconductors reliably was a black art. At times you’d have the recipe and turn out chips, and the next week something would go wrong, and your fab couldn’t make anything that would work. Engineers in the very small world of silicon and semiconductors would meet at the Wagon Wheel and swap technical problems and solutions with co-workers and competitors. In 1975 a local set of hobbyists with the then crazy idea of a computer in every home formed the Homebrew Computer Club and met in Menlo Park at the Peninsula School then later at the Stanford AI Lab. 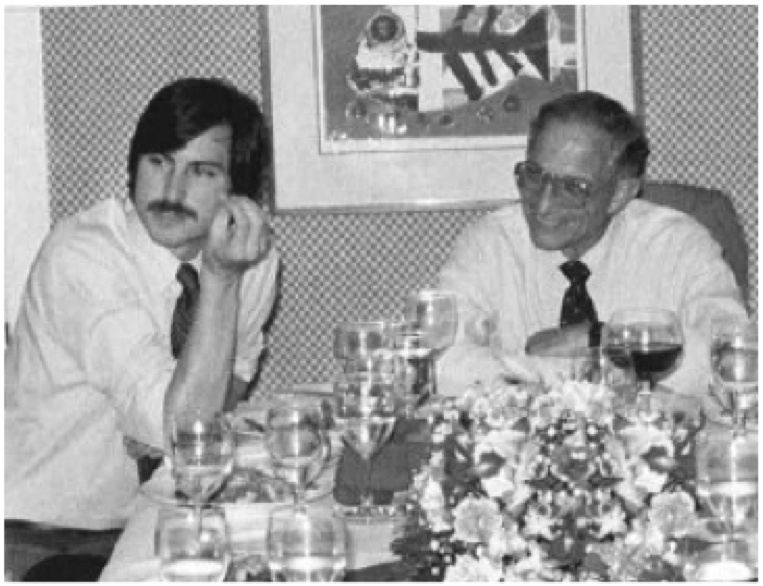 The goal of the club was: “Give to help others.” Each meeting would begin with people sharing information, getting advice and discussing the latest innovation (one of which was the first computer from Apple.) The club became the center of the emerging personal computer industry. While the idea of groups (chips, computers, ethnics) helping each other grew, something else happened. The first generation of executives who grew up getting help from others began to offer their advice to younger entrepreneurs. These experienced valley CEOs would take time out of their hectic schedule to have coffee or dinner with young entrepreneurs and asking for nothing in return. By the early 1970’s, even the CEOs of the largest valley companies would take phone calls and meetings with interesting and passionate entrepreneurs. In 1967, when he was 12 years old Steve Jobs called up Bill Hewlett the co-founder of HP. In 1975, when Jobs was a young unknown, wannabe entrepreneur called the Founder/CEO of Intel, Bob Noyce and asked for advice. Noyce liked the kid, and for the next few years, Noyce met with him and coached him as he founded his first company and went through the highs and lows of a startup that caught fire. Last week in Helsinki Finland at a dinner with a roomful of large company CEO’s, one of them asked, ”What can we do to help build an ecosystem that will foster entrepreneurship?” My guess is they were expecting me talk about investing in startups or corporate partnerships. Instead, I told the Noyce/Jobs story and noted that, as a group, they had a body of knowledge that entrepreneurs and business angels would pay anything to learn. The best investment they could make to help a startup culture in Finland would be to share what they know with the next generation. Even more, this culture could be created by a handful of CEO’s and board members who led by example. I suggested they ought to be the ones to do it. We’ll see if they do. Over the last half a century in Silicon Valley, the short life cycle of startups reinforced the idea that – the long term relationships that lasted was with a network of people – much larger than those in your current company. Today, in spite of the fact that the valley is crawling with IP lawyers, the tradition of helping and sharing continues. The restaurants and locations may have changed, moving from Rickey’s Garden Cafe, Chez Yvonne, Lion and Compass and Hsi-Nan to Bucks, Coupa Café and Café Borrone, but the notion of competitors getting together and helping each other and experienced business execs offering contacts and advice has continued for the last 50 years.